Paris Speech Masters club member and Past President, Antonio Meza, winning the District 59 award. 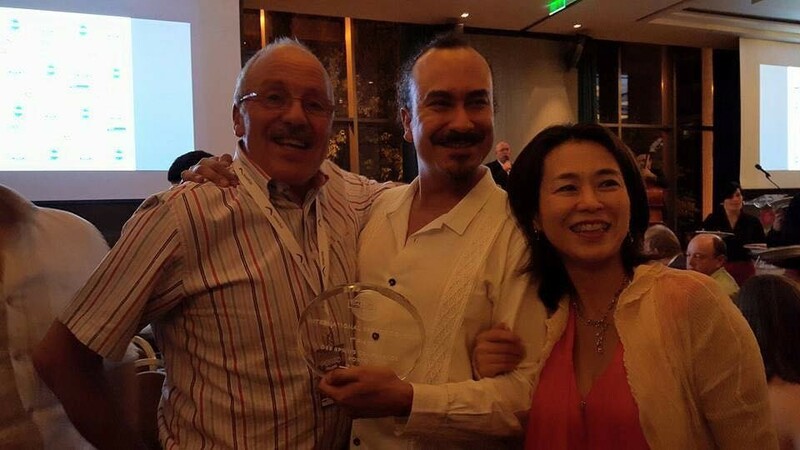 We are proud to announce that after winning the Area A4* International Speech Contest on March 21, 2015, our fellow member Antonio Meza (Paris Speech Masters), went on to win the Division 59 award. This lead him to the Road to Vegas. It is now contest season for Toastmasters around the globe. When the contests begin, there are over 30,000 Toastmasters who enter contests at their local clubs to begin the process of finding the best. When Antonio left for Las Vegas in August 2015, these 30,000 had been whittled down to the last 100 contestants from around the globe. The 2015 European champions of public speaking: Antonio Meza (for District 59) and Thomas Rose (for District 95) participated in the International Speech Contest in Las Vegas in August 2015. We are very proud! For more information about the 2015 International Speech Contest Winner, or other Toastmasters news, please read our "In the News" section. * Area A4 includes 4 Paris TM clubs: Paris Speech Masters, La Défense, TM of Paris, and TM 75. ** Area A5 includes 3 Paris TM clubs: OECD, The Europeans, Busy Professionals and Val d'Europe.